Through April 17, St. Marylebone’s Parish Church in London is hosting an exhibition on the Stations of the Cross, curated by Art Below founder Ben Moore to raise proceeds for the Missing Tom Fund. 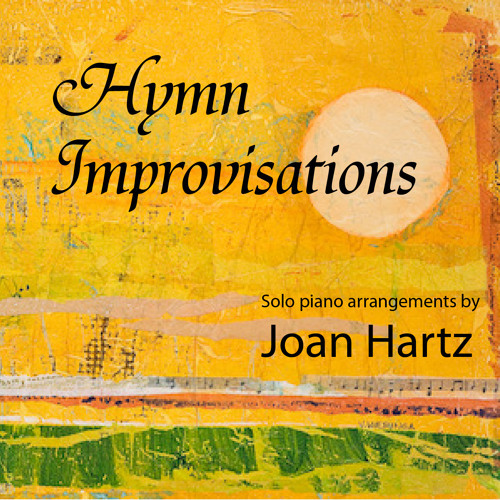 Admission is free, but donations are accepted, and all the works are for sale. For some of the artists—like Chris Clack, Paul Fryer, and Wolfe von Lenkiewicz—the figure of Jesus has served for years as a recurrent subject in their bodies of work. Other artists, however, are treating it here for the first time. You’ll find a mixture of media and styles on display at St. Marylebone’s, from oil paintings to minimalist works to digital collage. One of the aims of the exhibition, it appears, is to strip the Stations of their traditional dress and give them a more up-to-date look, so as to stimulate fresh perceptions (a tactic known as defamiliarization). 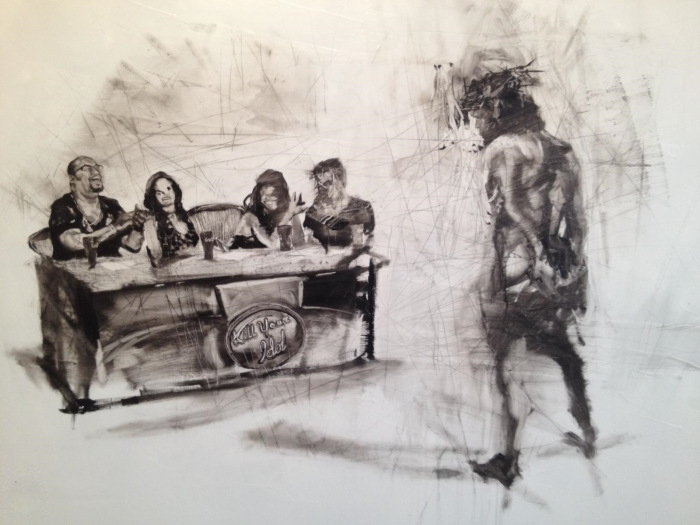 For example, Antony Micallef’s take on Station 1, Jesus is condemned to death, shows Jesus standing before an American Idol judges’ panel instead of before Pontius Pilate. Having just performed his audition for the chance to become America’s favorite singer, he now stands trial before four judges. Their sentence? “It’s a no”—four times over. He doesn’t have the right image. And they don’t like the tune that he sings. Antony Micallef, Kill Your Idol, 2014. Oil on linen, 100 x 150 cm. By presenting this passion event within the framework of a reality TV show competition, Micallef challenges us to consider a few things: What happened to Jesus’s career after that first fatal judgment was passed? Is he someone that the public would cast its vote for today? Are we idolizing the right people, the right things, in our lives? Station 13, Jesus is taken down from the cross, is represented in part by Paul Fryer’s Black Pieta, in which the dead Christ sits in an electric chair rather than in the lap of his grieving mother. This sculpture decries the injustice of capital punishment. How many more innocent people has the state put to death since the time of Christ? Paul Fryer, Black Pieta, 2009. Wax, glass eyes, human hair, oil paint, wood, steel, epoxy resin, fibreglass, thorns, silk fabric, and dye, 119 x 72 x 78 cm. 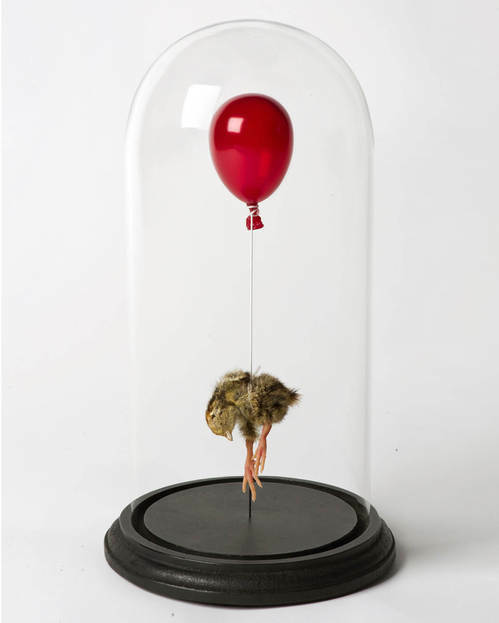 In what I consider the most compelling piece, a dead chick dangles from a red balloon inside a bell jar. Though not created specifically for this exhibition, Small Still Birth by taxidermist Polly Morgan was selected for its ability to speak to the death and resurrection of Christ. Polly Morgan, Small Still Birth, 2010. Taxidermy quail chick, resin-cast balloon, wire, glass, and wood, 25 x 12 cm. In a day-in-the-life-of documentary aired on the BBC, Morgan said that she intended for the balloon to be evocative of a womb, and the string an umbilical cord—commonly thought of as symbols of life, but not so for the stillborn. It would be easy to look at this piece and to despair, to despair for all the beings who are birthed into this world already dead. What a cruel twist of nature, in which womb becomes tomb! But that would be to not consider the piece in its totality. For the balloon lifts up the little bird from death, into something beyond. And thus the tone is ultimately one of hope, not despair. In this sense, the work is a fitting representation of the fifteenth Station of the Cross, the Resurrection, in which Jesus was pulled up by his passion into new, transfigured life. For him, tomb became womb, a nest of ripening, which he ripped out of three days later, born anew. The Stations of the Cross exhibition offers observers of Lent this year an opportunity to engage with the Via Crucis in a fresh way. To learn more, visit www.artbelow.org.uk. This entry was posted in Western Art and tagged easter art, lent reflections, way of the cross. Bookmark the permalink.